Place lamb, breadcrumbs, spices and seasoning in a bowl; stir to combine. Shape mince into 8 small patties. Preheat a grill, place patties under a grill and cook on both sides until done to your liking. Remove and set aside. Place the cornflour and flour in a bowl, stir to combine, whisk in the soda water to form a batter. Heat the oil in a pot until hot, dip the sliced zucchinis into the batter then place in the oil. Fry until golden, remove, drain on paper towel, season and serve. 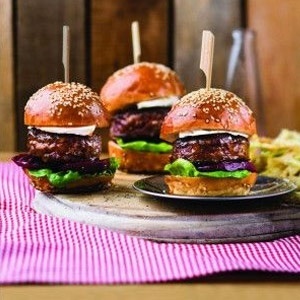 Fill rolls with lettuce, beetroot, patties and feta. Serve with zucchini fries.